Are you tired of your child coming home from school and tossing their books, backpack and schoolwork all over the furniture or floor. The AdirOffice Kids Steel Metal Storage Locker is the perfect answer to restoring order to kids' bedrooms and study areas. Built to last, the locker is durably crafted using rugged steel framing and sides for long-term strength and use throughout the years. The bottom is outfitted with rubber feet for stability, designed to prevent the locker from slipping or causing scratches and unsightly scuff marks on any surface. Featuring a 15-inch width and depth with a 24- or 48-inch height, the AdirOffice is great place for stashing schoolwork, sporting equipment, toys, and games. 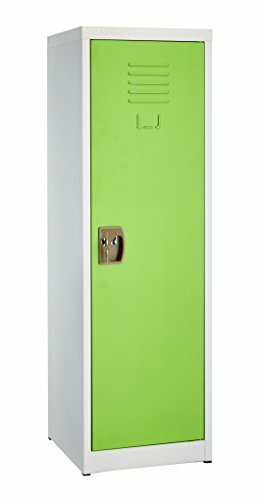 This child’s locker also has two internal hooks that can be used for coats, hats, backpacks, sports gear and more. Lightweight and easy to assemble, this locker will make a great present for birthdays, holidays and other gift-giving occasions. The door is furnished with a lock to secure the contents inside and is vented to allow airflow. Additionally, the door is furnished with a name tag slot so it can be personalized with your child’s name. The steel locker comes in a neutral off-white color for seamless incorporation into any existing decor, and is accented with a vibrant door color in your choice of blue, green, red or purple. As such, it will accommodate everyone’s taste, making it ideal for boys and girls alike. Two keys are also included for quick and easy access inside. HIGH-QUALITY CONSTRUCTION. Expertly constructed using rugged steel framing and sides, the AdirOffice Storage Locker will provide long-lasting strength and use. It's also outfitted with rubber feet on the bottom to prevent the locker from slipping. CHOICE OF SIZE AND COLOR. Featuring a 15-inch width and depth, this kid's locker is available in a 24- or 48-inch height. The sides are furnished in a neutral off-white color, accented by vibrant door colors in your choice of blue, green, red or purple. SUFFICIENT STORAGE SPACE. Restoring order to children's bedrooms and study areas. Kids can stash their schoolwork, sporting equipment, toys and games behind the locker door, while two internal hooks are ideal for coats, hats, backpacks and sports gear. EASY ACCESS. The door can be locked to secure the contents and comes with two keys for easy access inside. Additionally, the lockable door is vented to allow airflow and includes a convenient name tag slot for personalization. GREAT GIFT IDEA. Shipped as a kit with easy-to-follow, assembly instructions, this storage locker is a great project for parent-child interaction. It makes a great gift for birthdays, holidays and other special occasions for any child, boy or girl.